"Really quite impressive Service! Norm is a helpful guy. He picked up on the first ring and arrived at my home in less than an hour with a happy smile." "Our AC unit was making a low humming noise and the air was blowing warm. 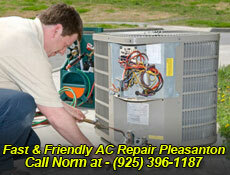 I called AC Repair Pleasanton to come out to give me an estimate. Norm, the owner arrived within an hour and replaced a fuse and cleaned the unit up nicely. He also changed out the filter. The cost was well worth his time. Good job from a fantastic service!" We're AC Repair Pleasanton and we specialize in air conditioning and heating repair for residential (central ac units) to commercial HVAC systems. My name is Norm and I will personally come out to your home or business. Our guarantee is simple, we offer your money back if you’re not completely satisfied with our service. It's tough to know if your choosing a company you can trust, that's why when we come out to your home we make sure your comfortable with our service. It can be n expensive task if your system needs to be replaced, that's why we will do everything in our power to get your current AC unit up and running. 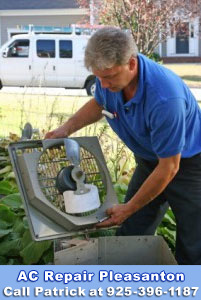 If your looking for experience, We have repaired and tested more HVAC units than all other companies combined. We have a twenty point inspection procedure that we strictly follow to insure your cooling system is working properly and trouble free. If a part needs replacing don't worry, all our trucks carry all the necessary replacement parts to finish the job the same day. What's Brands are the Most Reliable? Installing and designing heating or cooling systems is what we do best for your home or light commercial building. We recommend and install the best most efficient heat pumps that will save you money in the long run. All of our systems come with a cost to benefit spreadsheet highlighting the key points. 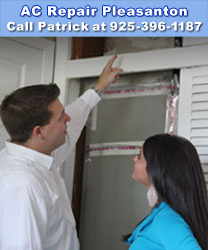 We will show you different manufacturers so you can make an informed decision on what is best for your home or budget. Our preferred brand is Carrier. Pleasanton is situated in the Tri-Valley area, if you’re familiar with San Francisco; it is east of this major city. The climate in general is warmer and drier than the rest of the area. We average about 250 sunny days per year so it pays to have a good ac unit. July through September is some of the hotter months averaging from 87 to 90 degrees. August can get in the hundreds. We knew this would be one of the highest demand areas in the bay area for a good air conditioning company to grow.